AAAP kicks off Astronomy Weekend with the Friday, March 9, 2018 AAAP meeting at the Carnegie Science Center, followed by AAAP member volunteers sharing telescopes, table displays and hands-on activities in the Lobby and entrances Saturday and Sunday, March 10 and 11 as the Carnegie Science Center celebrates Space Out! Astronomy Weekend. Astronomy weekend at the science center showcases the astronomy that happens at the Science Center, as well as the latest astronomical news, tools and hands-on activities visitors can experience throughout the year. This event is “free with the cost of admission.” See the Carnegie Science Center website for more information. AAAP volunteers will be happy to answer questions about astronomy, telescopes, our club and more. 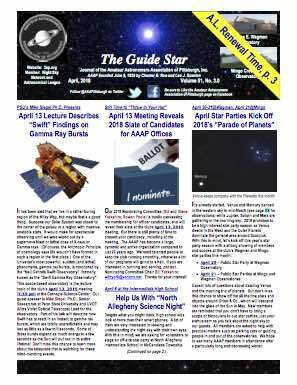 AAAP volunteers can see the AAAP’s Guide Star newsletter for details on how to volunteer for this event and on the members email list. The public will find updates on both the Carnegie Science Center Facebook and on AAAP’s Facebook, too. The AAAP meeting on Friday is free and open to the public. There is $5 Parking Lot Fee at the Science Center.